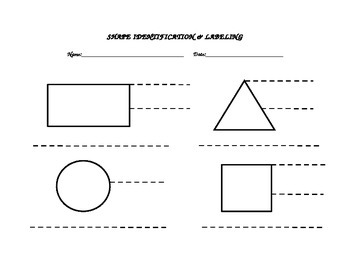 This worksheet features the 4 basic shapes, circle, rectangle, triangle, and square. There are lines extending from one side (vertex) and one corner (angle) of each shape for labeling. The circle only has one line extending intended to be labeled "curve." Under each shape is a place for your students to write the name of the shape, either from memory, using invented spelling, or using a word bank you can provide.